We started our day off with a walk down to the inlet to see if there was a close by fish market. Today is FISH day and we were hoping for a fresh catch. We immediatly realized that the "fish market" our host said was "right around the cornah" was probably several miles away so back to the car we headed to start our rode trip around the peninsula. Once out of town and headed to our first view point in the naitonal park, we encountered some pretty narrow roads, barely wide enough for the car, let alone another in the opposite direction. This is when we leaned what the "single track road" sign meant. Most of the roads in the peninusula are walled using high levies, hedges growing on the top, and cleanly mowed to keep things reasonably clear. We actually met up with one of those mowing tractor along the way...a large backhoe of sorts with a mower mounted on its side. Sheep grazing on the hillsides. We reached the end of the road nd Martin's Haven. Parked in the national park lot we headed out to climb up to the lookout point. The ferry boards here to take folks to the nearby island for a day visit. We had to pass through cow fence and up the path to get these amazing view. Far below on the bay kayakers were enjoying the beautiful day. Leaving the car park the one-lane road was blocked in both directions with folks that didn't seem to understand only one car could get through at a time. Frustrated by their ignorance, I got out of the car and for the next 30 minutes directed them forward, backward and up on to the side so that we and the mass backed up behind us could get through. You can only imagine the chats I had with some of them that were down right ridiculous. Once clear we continued along the coast stopping often for the views. Look how clear the water. At a nearby beach we stopped for coffee at a little cafe. Interested selection of condiments. Can wait to try the brown sauce. At St. Davids we parked in the lot and set up a picnic in the motorcycle spot. No sooner had we completed our lunch arrangment that a couple of bikes drove in. We had a nice chat with the fellows as they remarked about our very nice lunch. Ha-ha..
Lilacs in full bloom everywhere. A shot of the ruins of the bishops palace. Next we wandered over to the ruins and explored all of the nooks and passageways,climbed a few towers, and enjoyed the views from the tops. On the path back to the cars we spotted these fellows frolicking in the creek. What fun. We continued on the one lane road along the coast. We soon realized that getting any views was futile due to the high walls. We however did not give up our serach for all of the viewpoints shown on the map, the names not matching and of the road signs, all in Welsh, and of no help whatsoever. A lovey cottage along the way. We ended out day shopping at a TESCO, Wales version of a Costco. 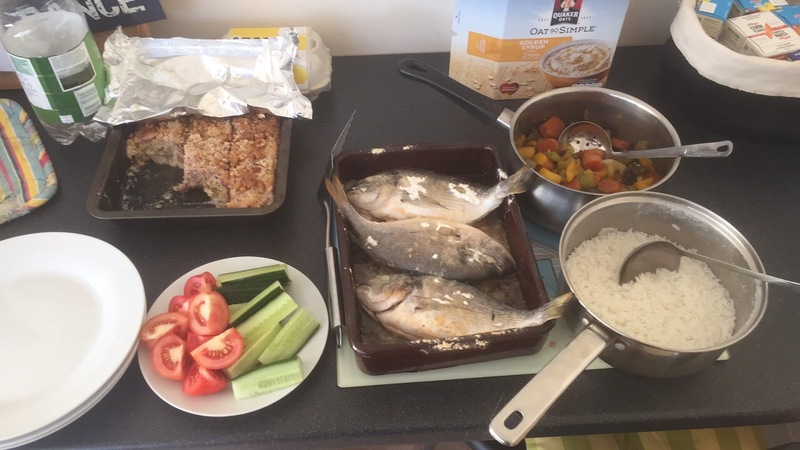 We found fish and got home to fix a lovely dinner of baked bream with all the fixings.